PowerShell is an automation platform and scripting language for Windows and Windows Server that allows you to simplify the management of your systems. Unlike other text-based shells, PowerShell harnesses the power of the .NET Framework, providing rich objects and a massive set of built-in functionality for taking control of the Windows environment. Cmdlets are specialized commands in the PowerShell environment that implements specific functions. These are the native commands in the PowerShell stack. Cmdlets follow a Verb-Noun naming pattern, such as Get-ChildItem, helping to make them self-descriptive. Cmdlets output their results as objects, or collections thereof (including arrays), and can optionally receive input in that form, making them suitable for use as recipients in a pipeline. But whereas PowerShell allows arrays and other collections of objects to be written to the pipeline, cmdlets always processes objects individually. For collections of objects, PowerShell invokes the cmdlet on each object in the collection, in sequence. While there has always been possible to execute PowerShell scripts through the Execute Task using full path to PowerShell.exe in the command field and your script in argument field, VisualCron also offers a dedicated PowerShell Task. The main difference between the Task and PowerShell.exe is that the the PowerShell Task, is that VisualCron executes within a PowerShell host. The environment is slightly different and some commands are written differently. For example, if you want to write to output you use write-output. 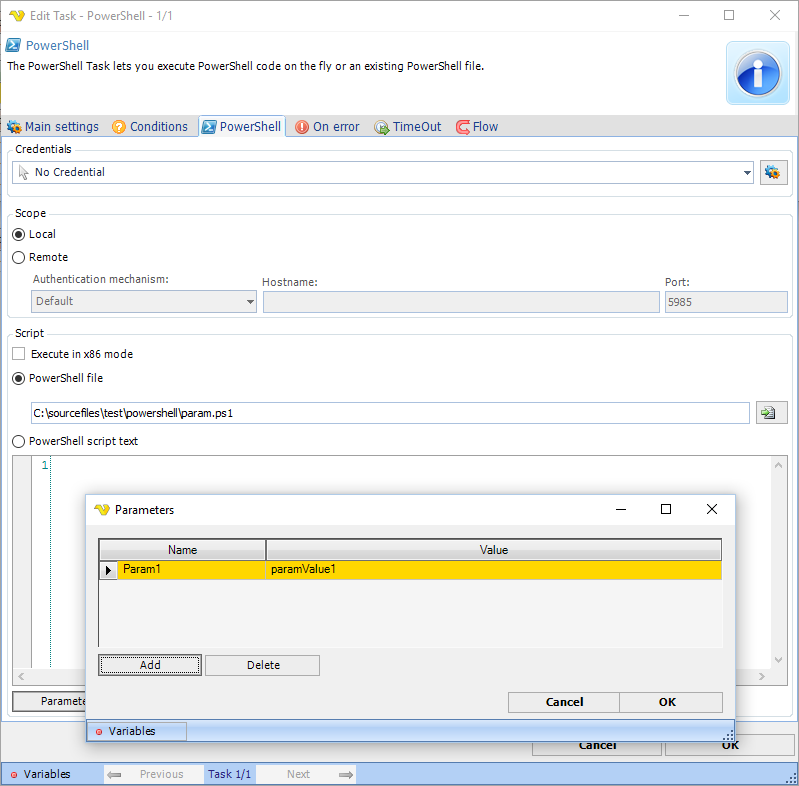 The main advantages with using the PowerShell Task is that you can keep and edit the PowerShell script within VisualCron but also take advantage of VisualCron Variables. Anywhere within the scripts and supplied parameters you can use Variables. This lets you use dynamic, real time values that are converted to text at runtime. When you automate PowerShell through the PowerShell Task VisualCron picks up any errors and output so you can pass these on to upcoming Tasks.